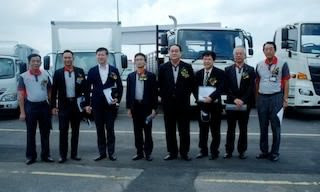 SEREMBAN: Japanese diesel truck and bus manufacturer Hino Motors Ltd has full confidence in Malaysia's economic climate and plans to remain in the country. Hino Motor Sales Sdn Bhd managing director Ken Iwamoto said for that reason, the company is beefing up its operations here. The company said it has upgraded its Hino Total Support Customer Service Centre at a cost of RM8 million at the Sendayan Tech Valley. "This centre is the first of its kind outside of Japan, thus reflecting Hino's confidence in Malaysia's economic potential," Iwamoto told reporters at the centre today. He added that the centre upgrade will strengthen the company's footing in the country since it started operations in 1977, as part of the efforts to reduce accidents and fatalities, trim cost and also improve road safety. Among others, the centre offers free training for existing drivers or aspiring professional drivers as well as a historical gallery of the firm. Hino is the country' s number one diesel truck and bus maker commanding a market share of 35.7 per cent last year selling 5,870 units and targets to sell 6,000 units this year.